Hey all! So every Sunday I listen to our pastor pray for local churches, and it's always stuck with me. Rather than being in competition with them, we pray for their success. That God would bless their message, increase their reach, and protect their ministry. And we pray for safety and security for their families. It's made me think...why not do that with all the authors I've been blessed to meet? The world of writing could so easily disintegrate into competition and comparison. And wouldn't that be exactly what the enemy wants? To distract us from our calling? It's not simply for the writing world either. Each of us has a purpose God created us for. Don't let satan pull your focus off of it by enticing you to watch others with similar callings. Instead, pray for them! 1 Timothy 2:1 says, "I urge you, first of all, to pray for all people. Ask God to help them; intercede on their behalf, and give thanks for them." So that's what I'm going to begin doing every week. Every Wednesday over on my Facebook page I'll be featuring one author to pray for that week in our Author Prayer Circle. My hope is that you'll all circle around them with me and lift them up. 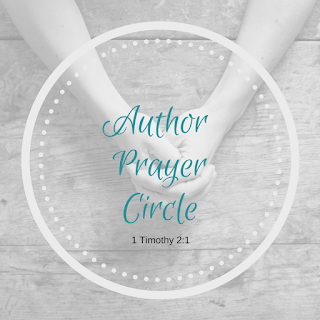 We'll do exactly what 1 Timothy 2:1 instructs: ask God to help them, intercede for them, and give thanks for them. I love this idea, Susan!